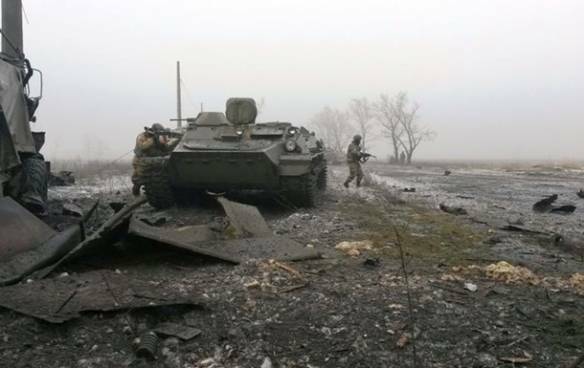 In the fog of winter war in Ukraine. The week of February 2 registered an explosion in political intrigue around the war in eastern Ukraine, and some sort of pause in hostilities is likely to ensue. Undoubtedly, this is a positive development, but it would be an overstatement to describe the late-night talks in the Kremlin between President Vladimir Putin and the two European envoys—German Chancellor Angela Merkel and French President Francois Hollande—as the “last chance” to stop the war. The five-hour talks concluded without any agreement or press conference. And during their brief photo-session, the three leaders wore their sternest facial expressions, demonstrating how hard it was to reach the compromise, which in fact had been pre-negotiated. Merkel and Hollande held several rounds of phone talks with Putin before hitting the road for their shuttle diplomacy, in which their first stop was Kyiv before proceeding to Moscow. That trip was followed up with another four-way phone conference on Sunday. The parties, indeed, need to show personal commitment to the deal, primarily to their respective domestic audiences. At the same time, they likely realize full well that this latest peace initiative has begun unraveling well before any signing ceremony could take place, if it happens at all. The rest of the article is in Eurasia Daily Monitor, February 9.